Plastic shopping bags are a major cause of pollution in the natural world. There has been much debate in Europe, and beyond, on how to limit their damaging effects and new policy directives are imminent. 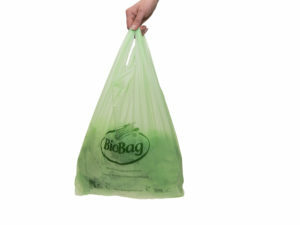 Globally it’s clear that the trend is to move away from disposable retail bags, produce bags and food liners towards more sustainable options. 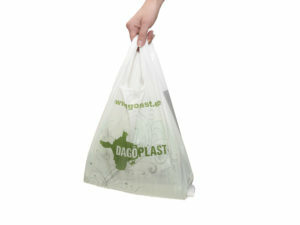 We produce ‘t-shirt’ shopping bags (with tie handles) in various sizes, from 15 liters up to 60 liters. The ‘t-shirt’ shape ensures that the bags are strong and easy to carry which makes them popular worldwide. Custom print is available in up to 3+3 color print. 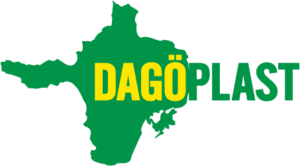 Dagöplast can accommodate order of varying sizes, from relatively small to large volumes, in mono film or 3 layer co-ex. To discuss your requirements and receive a quote, please contact us.